Not Very Far Away – Page 3 – Documenting the natural world where I live. Carterocephalus palaemon, Arctic Skipper, widespread in Minnesota. It was previously known from Carlton County by a historical record. There do not seem to be any recent records from the county other than this one. This small butterfly with dark brown wings and yellow spots is the Arctic Skipper (Carterocephalus palaemon). I saw it a few days ago on a warm, sunny, and humid afternoon on June 12. It was resting on a blade of grass in a sunny opening in an encroaching forest. Although the Arctic Skipper is widely distributed and ranked a G5 or “globally secure” there is only one record that I could find of it from Carlton County and it is historical but there was no information about when or where it was seen or who saw it. The upper wing surface is dark brown to almost black with roughly rectangular yellow spots. Below they are like the color of a deer fawn and marked with black-rimmed yellow spots. Wingspread is 2.5 to 3.2 cm. A circumboreal species found in North America from Alaska to Canada’s Atlantic coast and south to California and Pennsylvania. Not truly an Arctic species. Larvae of Carterocephalus palaemon eat grasses. In California purple reedgrass (Calamagrostis purpurascens) is reported as a larval host. In some European countries, brome (Bromus spp.) are preferred larval hosts. Purple moor-grass (Molinia caerulea) has been reported as a larval host in Scotland. Purple reedgrass is rare in Minnesota and purple moor-grass does not grow here. There are bromes both native and introduced in the state as well as the native Canada bluejoint grass (Calamagrostis canadensis). It is likely that Carterocephalus palaemon larvae feed on other grass species besides the few mentioned in the literature. Arctic Skipper Carterocephalus palaemon (Pallas, 1771) at BAMONA. Carterocephalus palaemon (Pallas, 1771) at the Bourgogne-Nature website. 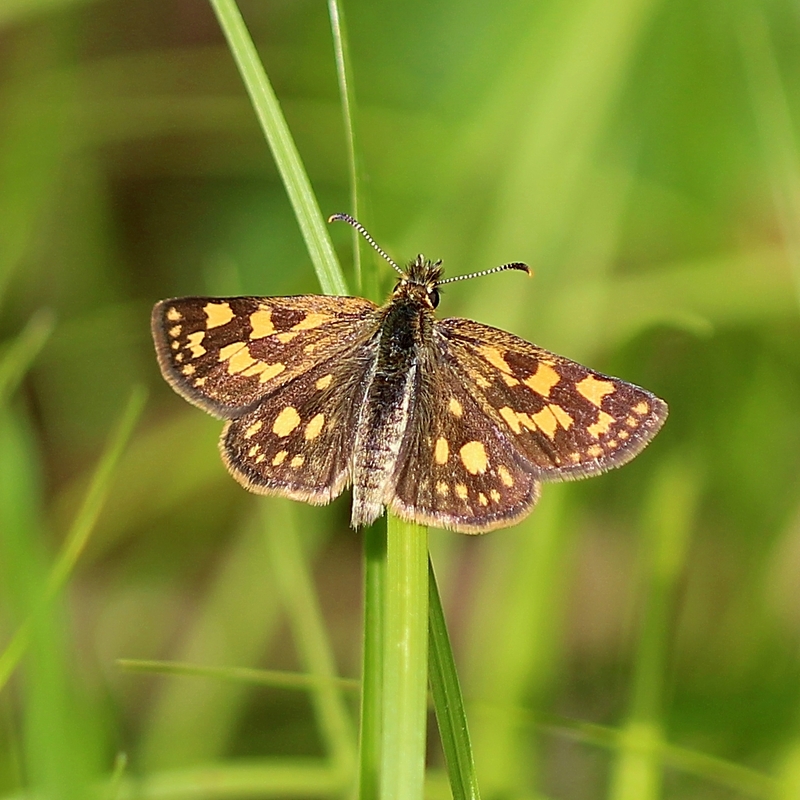 Chequered Skipper (Carterocephalus palaemon) at the Sottish Natural Heritage website. Species Carterocephalus palaemon – Arctic Skipper – Hodges#3982 at the Bug Guide website. Hypena palparia (Family Erebidae), possible new record for the state. Seen on June 16, 2018. Agonopterix atrodorsella (Family Depressariidae), possible new record for the state. Seen on May 24, 2018. Argyrotaenia mariana (Family Tortricidae), possible new record for the state. Seen on May 26. 2018. One thing that often happens when doing an inventory of plants and animals in a particular region such as in the county where I live is the discovery of species not previously known from there. This has been my experience with plants in Carlton County beginning in 1992. Back then there was only Ownbey’s and Morley’s Vascular Plants of Minnesota: A Checklist and Atlas for plant species occurrences by county for Minnesota. The internet has greatly expanded the available information on species distributions and this holds for plants, lichens, and many kinds of animals such as moths. Many museums and universities have searchable databases listing taxa by region or even county level often on maps showing where these species have been found. Some even provide historical data such as when a particular species was seen and/or collected. Unfortunately, finding a volume like Ownbey and Morley for moths even for a state seems pretty much out of the question. There are other sources of data on moth species occurrences although their reports may not be complete. The first two sources I rely on are the maps at the Moth Photographers Group (MPG) and Butterflies and Moths of North America (BAMONA). Maps at MPG are based on archived specimens and are accurate to the county level. BAMONA is based on citizen-scientist contributions and these are accurate to township level. The weakness in both of these sources is the human factor. For both MPG and BAMONA there seem to be more records near larger population centers where colleges and universities, and hence entomologists and/or interested amateurs, are located compared to areas of the country with smaller populations and distant from colleges. The third source I look to for Minnesota moths is a Minnesota DNR report (A Survey of Lepidoptera in Three Priority Areas of the Minnesota State Parks System) published in 2009. This report lists all the moth (768) and butterfly (72) species found in thirteen Minnesota state parks between southeastern and northeastern Minnesota over a two-year period. Jay Cooke State Park, which is in Carlton County in northeastern Minnesota, was not included in the survey. 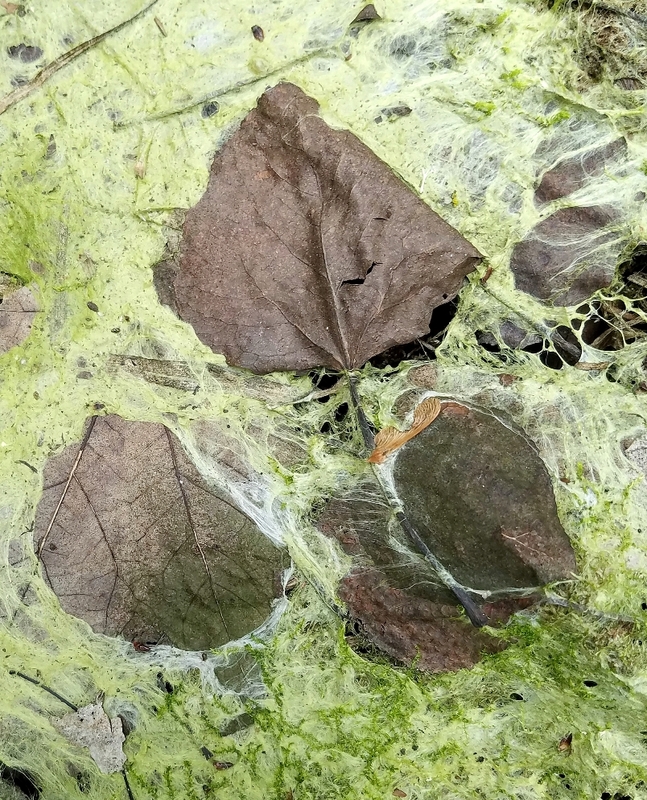 The purpose of the survey was to determine what other lepidopteran species might be affected if a Bt spraying program were initiated to control the introduced Gypsy Moth (Lymantria dispar dispar), a potential pest insect in the state. Thankfully, Bt was not used and a mating disrupting pheromone was instead. I have not done a complete list of new species records for Carlton County because it does not matter as almost every moth I find is a new record for the county. However, as I add more species to the checklist I have noticed that some appear to be new records for the state. Four of these are shown in the photo gallery above. These are not the only ones just some of the most recent. Looking at the maps at MPG and BAMONA it quickly becomes clear that there is a deficit in the record of the lepidopteran fauna of Carlton County (not too unlike the record of the county’s flora). One could get the impression that there is little moth biodiversity here but that would be a mistake. As of June 15, I have photographed and identified almost 270 species of moths. Of these, 100 were photographed and identified this year over a two month period. Even more importantly all were taken on my property. What other species might be found in the oak-maple-basswood forests? Or the bogs? Or the cedar swamps? Ownbey, G. B., and T. Morley. (1991). 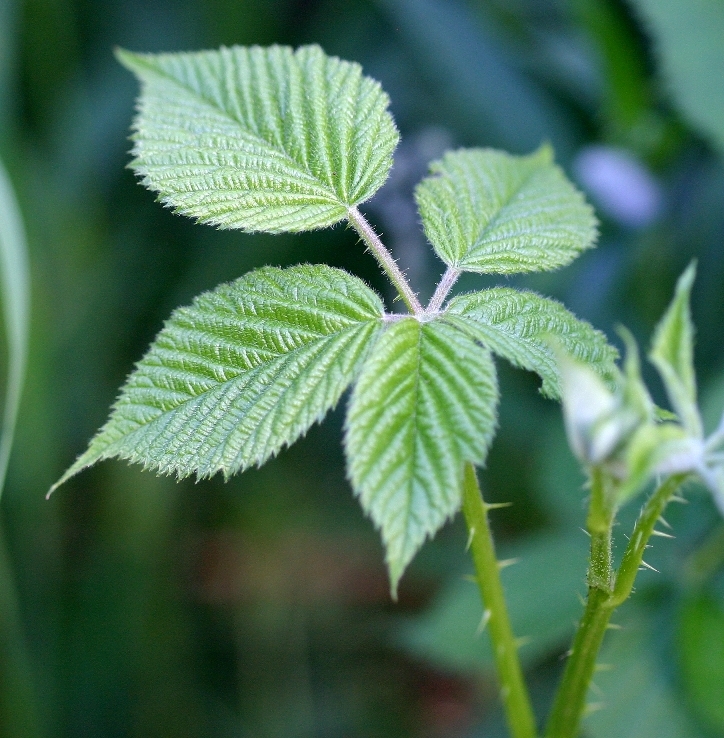 Vascular plants of Minnesota: a checklist and atlas. University of Minnesota Press, Minneapolis, Minnesota. 320 pages. Quinn, Edward M., and Danielson, Ron. (2009). A Survey of Lepidoptera in Three Priority Areas of the Minnesota State Parks System Final Report. 49 pages. Well, not me, not yet anyway but here are two moths and a beetle that were flying the other night. Catching these insects at that moment was sheer luck. The moth Habrosyne scripta will be the subject of a future post. A giant really with a wingspan of 115 mm (~4.5 inches). This is one of the giant silkworm moths known as Antheraea polyphemus. It arrived at my porch light at about 12:30 AM on June 13. So I took a lot of photos then went inside and turned out the light. At dawn it was still there but had fallen from the screen door so I set it on a tarp covered box and placed a small footstool over it for safety. By early afternoon the moth had flown away. 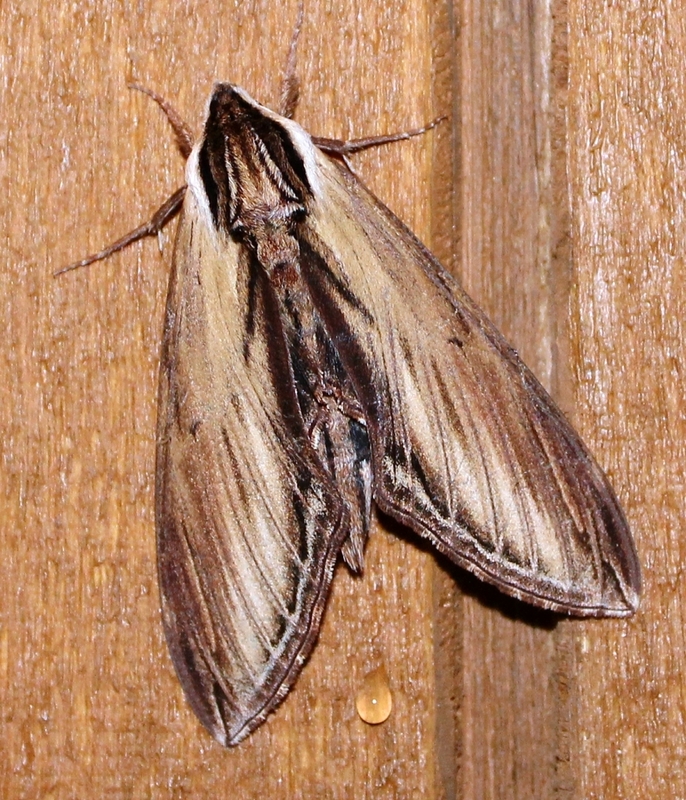 I seldom see these large moths, including their larvae, although they are said to be widespread and common. I’m wondering what tonight will bring since I plan on staying up late again. Antheraea polyphemus showing wing undersides. A. polyphemus is a distinctive moth species. Apart from its large size the most obvious features are the four eyespots on the wings. There are two small spots on the forewings and two larger ones on the hindwings. The spots on the hindwings are the largest and most brightly colored with a deep black outline surrounding a deep blue interior dusted with many small white specks. at the bottom of the eyespot is an almond-shaped yellow spot with a translucent center. The eyepsots on the upper wings are very much like these yellow spots but with a thin black line enclosing them. The background color of the wings varies individually but is generally a pinkish cinnamon color often dusted with small black specks. Wing margins are separated from the rest of the wing by dark and light-colored bands. The scales on the body, legs, and near the points where the wings attach are long and look like hairs. 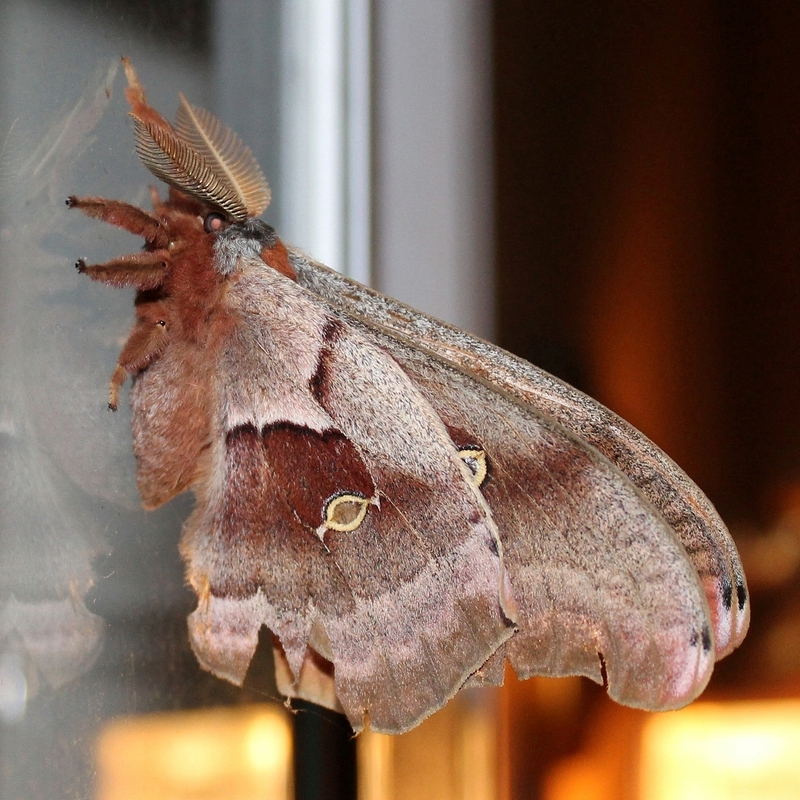 The moth shown has feathery antennae (used to detect female pheromones) which means it is a male. Females have thinner antennae. 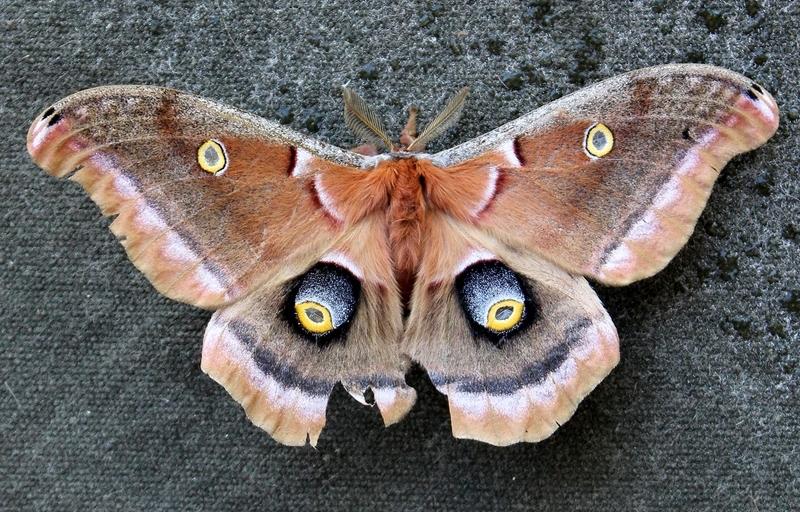 A. polyphemus occurs over most of north America from southern Canada (except Newfoundland) to Mexico and coast to coast in the US. The larvae of A. polyphemus feed on the leaves a variety of deciduous trees and shrubs including oak (Quercus spp. ), hickory (Carya spp. ), ash (Fraxinus spp. ), grape (Vitis spp. ), maple (Acer spp. ), birch (Betula spp. ), pine (Pinus spp. ), and willow (Salix spp.). Species Antheraea polyphemus – Polyphemus Moth – Hodges#7757 at the Bug Guide website. 890070.00 – 7757 – Antheraea polyphemus – Polyphemus Moth – (Cramer, 1776) at the Moth Photographers Group website. Another busy and late night but a productive one. I added several more species to the checklist but this one was already on the list after I found a caterpillar of the species last fall. It is the Laurel Sphinx Moth (Sphinx kalmiae). There is an abundance of potential food plants (ash and lilac) for this moth to choose from right around my house so I am hoping to find a few caterpillars later this summer.